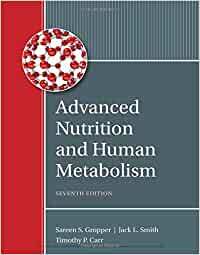 ADVANCED NUTRITION AND HUMAN METABOLISM clearly and accurately explains even the most complex metabolic processes and concepts in a student-friendly manner. The 7th Edition equips you with a solid understanding of digestion, absorption, and metabolism of fat, protein, and carbohydrates; examines the structures and functions of water-soluble and fat-soluble vitamins -- including their regulatory roles in metabolism; and provides information on vitamin and mineral food sources, recommended intakes, deficiency, and toxicity. With ADVANCED NUTRITION AND HUMAN METABOLISM, 7th Edition, you will be well prepared to continue your studies in the field of nutrition. Timothy Carr is the Jean Sundell Tinstman Professor and Department Chair of Nutrition and Health Sciences at the University of Nebraska-Lincoln. His area of expertise is nutrient metabolism in health and disease. Sareen Gropper is a professor with the College of Nursing at Florida Atlantic University; she also has a secondary appointment with the University's College of Medicine. Dr. Gropper is a Registered Dietitian and has expertise in nutrient metabolism as well as medical nutrition. Sareen Gropper is a professor with the College of Nursing at Florida Atlantic University; she also has a secondary appointment with the University's College of Medicine. Dr. Gropper is a Registered Dietitian and has expertise in nutrient metabolism as well as medical nutrition. Jack Smith was Professor and Chair of the nutrition department at the University of Delaware. He is now retired. Metabolism is his area of expertise. The 7th edition is the fourth edition of this book that I have purchased. It was the textbook I used when I took an advanced nutrition course years ago, and I haven't found a better one since then. Heavy on biochemistry from cover to cover. It is my recommended textbook for the Clinical Nutrition I course I teach, as well as a recommended reference textbook for the other more advanced clinical nutrition courses that I also teach (as part of a CNME doctorate in naturopathic medicine). If you want to learn advanced nutrition, this is the book as far as I am concerned - Jeffrey Sepulveda, N.D.
A must for dietetics students! Well detailed synthesis explanations used for self studies and was what i was looking for. Item arrived well packaged, in perfect condition and as expected. No complaints at all. Highly recommend! 5.0 out of 5 starsAnd this new edition has updated and amazing diagrams! This is definitely in the top 5 MUST have nutrition/biochemsitry books of ALL TIME!!! And this new edition has updated and amazing diagrams! !